H.M.S. Bounty joins your fleet! Seen in Star Trek III: The Search for Spock and Star Trek IV: The Voyage Home. The Klingon Bird of Prey feature electronic movie lights and sounds! Measures 12 1/2-inches long, with a wingspan of 19-inches. Its massive wings are jointed for multiple modes! 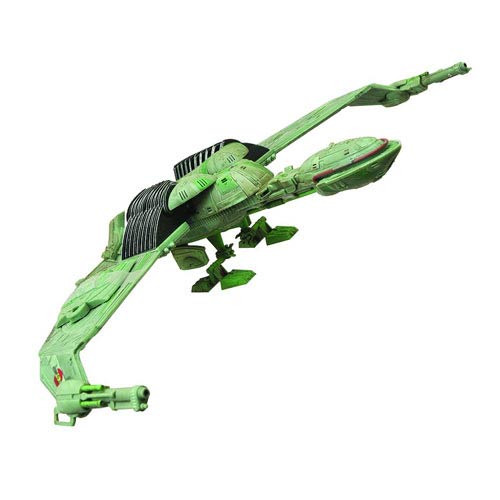 The Star Trek Klingon Bird of Prey H.M.S. Bounty Vehicle is based on the Klingon ship captured by Captain Kirk and his crew in Star Trek III: The Search for Spock and then flown home by the Enterprise crew in Star Trek IV: The Voyage Home. Decorated with the ship's given name, the "Bounty" - as in the famously mutinied H.M.S. Bounty - this Bird of Prey comes with a Federation display stand to indicate its true allegiance. Measuring 12 1/2-inches long with a wingspan of 19-inches, the vessel features movie-specific lights, sound effects, and dialogue from Star Trek IV: The Voyage Home! Its wings raise and lower so you can display it in flight or on a flat surface using the included landing gear. Ages 15 and up.